“Who is Angelie Sabanal?” That was the intriguing question of the night at ONE: IRON WILL in Bangkok, Thailand this past March when she took on hometown favorite Rika “Tinydoll” Ishige in a three-round atomweight encounter. Ishige was heavily favored to win the bout against a relatively-unknown Filipina martial artist entering a high-profile match on a stacked card, but Sabanal begged to disagree and educated everyone about who she is and what she is capable of. 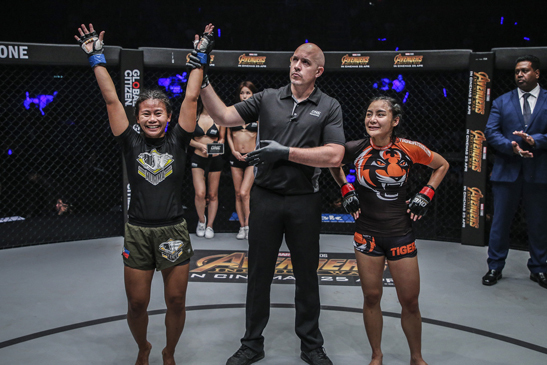 Sabanal pulled off a major upset in her ONE Championship debut, greatly relying on her savvy Muay Thai background to rout the Thai rising star via unanimous decision. The 29-year-old National Muay Thai Silver Medalist showcased her pinpoint accurate striking early on, peppering Ishige with stinging kicks and stiff punches. Although Ishige boldly traded strikes with the Filipina kickboxer from bell to bell, the latter pulled away in the final round, landing the more telling blows. In the end, Sabanal earned the undivided nod from the three judges at cageside. After capturing a hard-earned victory over Ishige, the thousands in attendance at the Impact Arena on that night were instantly introduced to the name of Angelie Sabanal. Despite the attention that her shocking win over Ishige gave her, it will take some time for Sabanal to get used to the spotlight as she is actually a shy, soft-spoken math teacher from Cagayan de Oro, Philippines. The 29-year-old practitioner of the discipline known as “The Art of Eight Limbs” works a college math professor at the University of Science and Technology of Southern Philippines. With her fiery performance against Ishige eight months ago, many took notice of her intrepid combat style inside the cage because her method in breaking down her opponent was akin to a seasoned veteran of the sport. However, unknown to many, Sabanal was late bloomer in martial arts as she started training in Muay Thai a few years after getting a college diploma. “I never thought that I would be a martial artist because I didn’t have the interest to try it back then. I was a volleyball player in grade school. Maybe, it’s my competitive spirit that brought me into this position right now,” she shared. “I enrolled in Muay Thai classes purely for fitness and self-defense. It took me five years to finally try to compete in Muay Thai because it never crossed my mind to compete nor become a fighter,” Sabanal added. At the age of 22, Sabanal started to learn the ropes of Muay Thai at Mindanao Ultimate Mixed Martial Arts, a home to the best and brightest talents in the Philippine’s southernmost major island of Mindanao. It took her five years to muster enough courage to climb the ring, right after she finished her master’s degree at the same university. “I was busy finishing my dissertation paper for my master’s degree. My priority at that time was to graduate, if not with honors. Although I was really progressing in Muay Thai, my focus was still fixed on getting a diploma,” Sabanal stated. “After I earned my master’s degree, my coaches were the first ones who congratulated me, but after that, they asked me if I wanted to join the team. It was in 2017 when I accepted the offer. Well, the rest is history,” she continued. It did not take long for Sabanal to capture gold medals on a provincial level, leading her to the 2017 Philippine National Muay Thai Championship where she attained a bridesmaid finish in the 57-kilogram category. “I got silver, despite the fact that I am naturally a 49-kilogram competitor. I was supposed to fight in the 50-kilogram category, but unfortunately, I didn’t have any opponent. I decided to fight in a higher weight class. Fortunately, I finished the tourney with a silver medal in hand,” Sabanal remembered. Sabanal did not disappoint as she made the most of her big opportunity, convincingly defeating Ishige over the course of three rounds. “I could not believe it because people were telling me that I should compete in the local scene first before I get my chance in ONE Championship. Aside from that, my opponent was clearly more experienced than me. Getting the victory over Rika is like winning a world championship,” she explained. Sabanal returns to action on Nov. 17 as she is slated to test her mettle against SEA Games Wushu Bronze Medalist Priscilla Hertati Lumban Gaol at ONE WARRIOR’S DREAM, which emanates from the Jakarta Convention Center in Indonesia. With her morale at an all-time high, Sabanal is confident that she will have her hand raised in triumph once more at the expense of a competitive Jakarta native like Lumban Gaol, who has won four of her last five matches in 2018. “I want to win again because I want to give back to my gym and the people who love and support me. I am competing for my country. Everything I do is for all of them and as long as I can do this, I will keep doing this,” she expressed. Sabanal may be stepping on Indonesian soil with little fanfare similar to her match with Ishige earlier this year, but the Filipina warrior assured that she will leave the arena again with everyone knowing who she is. “I don’t mind if they have no idea who I am before the fight. What matters most is that the fans in Jakarta will remember me after the match. Surely, I will do my best in my upcoming bout this Saturday,” she ended.